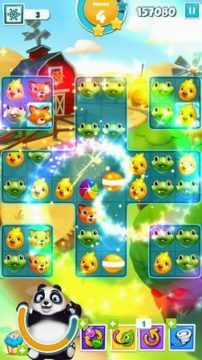 Like other match-3 puzzlers, this game lets you match pets to create special power-ups called “Super Eggs”. These could be anything from striped to rainbow eggs. Each egg clears a part of the game board when matched with 2 or more pets. You can also swipe 2 Super Eggs to create a big explosion. 1. Match 4 pets to create a striped egg: The striped egg, when matched with a same-colored pet, clears all pets in a column. 2. Make a T-shaped match to create an X-striped egg: Match the X-striped egg with a same-colored pet to trigger an X-shaped explosion. 3. Match 5 pets in a row or column to create a Rainbow egg: This egg is a favorite among most match-3 puzzle players. Just swap the rainbow egg with a pet to clear all pets of that type. For example, if you swap the rainbow egg with an octopus, all octopuses will vanish. Super Eggs can be quite useful to score more points, clear ice blocks and bring fruits at the bottom of the game board faster. Experiment with different combos to create massive explosions and clear maximum pets on the game board. For example: Matching two striped-eggs will create a double explosion, clearing almost half of the pets. The Helper at the bottom-left corner of the screen can be useful in clearing a major part of the game board. Match pets to fill a helper’s ability meter. You can use him when the ability meter is full – just drag and drop the helper on the game board to clear pets. The ability meter fills slowly, but the good news is that the meter carries forward any previous fill to the next level. In short, the ability meter does not reset back to 0 in a new level. Use a helper’s ability wisely. Use it only when you can’t solve a puzzle on multiple tries. You can also use it when you have few moves left and the objective is attainable. Remember: A helper’s energy meter builds up slowly. Once used, you will have to start from scratch. Use it sparingly. You get to open mystery chests after completing a level. A mystery chest contains a random material and/or a power-up. Materials earned from a mystery chest are added to your collection. They unlock additional helpers. For example: Collecting 10 bamboos will unlock the Panda Helper. You can also get materials as part of daily mystery chests. You just need to play daily to get bonus mystery chests. Materials are also used to upgrade helpers. For example: Collecting 20 materials will upgrade the Dog to level 2. Upgrading helpers have their own benefits, such as faster ability fill rate, extra ability tiles and bonus scores. Get materials from mystery chests earned from puzzles to unlock and upgrade them. You may also try replaying previous levels to collect materials faster. Tap on the paw icon at the bottom-left corner of the screen to get a list of unlockable helpers in Puzzle Pets. You will also find the number of materials required for each helper as well as upgrade benefits. Tap on an unlocked helper to find a list of features, such as bonus score, ability fill rate and additional ability tiles.